Refashion Co-op: #10 August Back to School: Pink Shirt Updated AGAIN!!! #10 August Back to School: Pink Shirt Updated AGAIN!!! GOAL: Refashion 10 Items for August Back to School. This is #10 of 10 for August. Cannot find any before pictures. Started as a long sleeve, button up shirt. 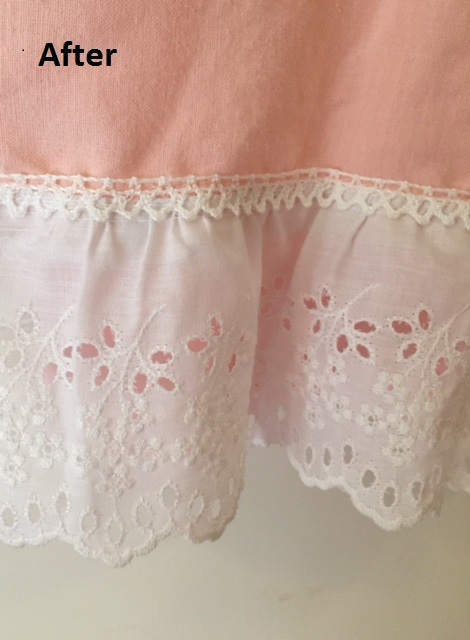 Changed from small white to large pink. Removed sleeve cuffs and sleeves rolled. Cut hem-line cut straigt across. Gathered eyelet @ 1 1/2 times the hem length. Stitched eyelet and narrow trim stitched in place. Stitched narrow trim over the collar trim and over pocket trim. 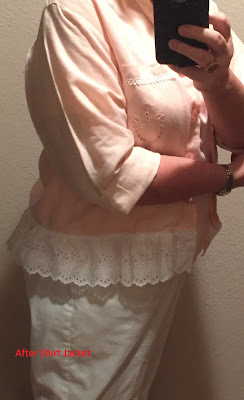 Linen Shirt from the closet. Much of my sewing stash is from a Dallas fabric/trim/lace/button outlet that was closing. 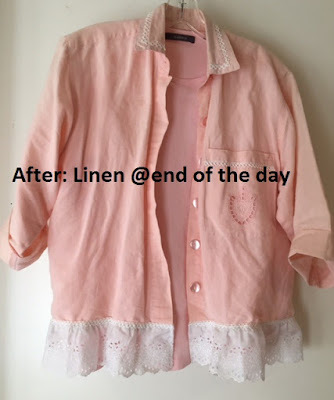 2nd Refashion for this shirt. 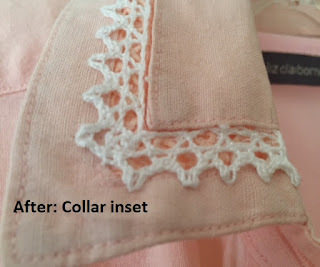 Pink Buttons added in 1st Refashion. Flat eyelet gathered 1 1/2 times. Very pretty, and the lace is gorgeous! I find myself adding or taking stuff away from a refashion item too. Just when I think I love it, I find something else wrong or not quite perfect. Lovely job.